The Chola Dynasty is considered one of the longest ruling dynasties in Indian history. However, its origin is known to none but according to the inscriptions left by Ashoka, the Kingdom was first mentioned in the early Tamil literature on Pillars of Ashoka in the 3rd century BCE. 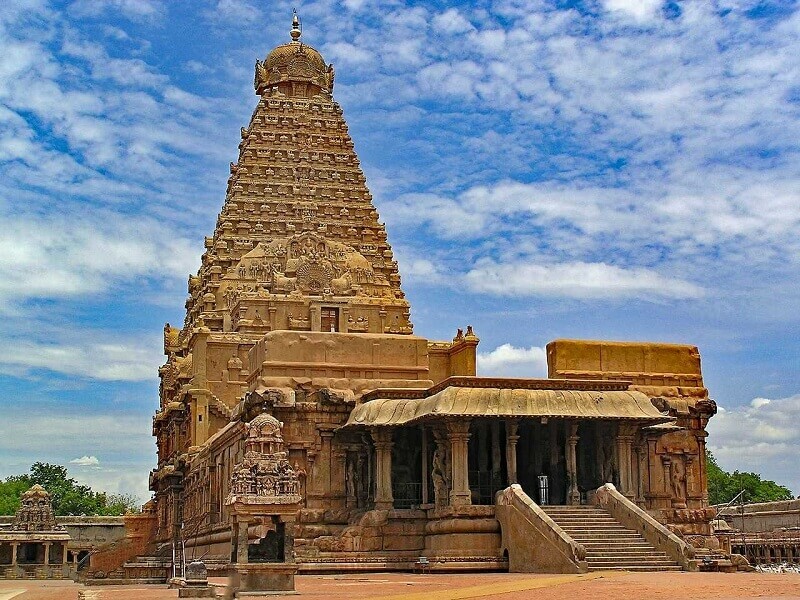 Eventually the Cholas established a strong Monarchy at Thanjavur and surrounding areas. The Chola kings ruled for almost four and a half centuries until the beginning of 13th century CE. During their reign, art and architecture in the South saw great achievements along with the areas of cultural assimilation, military conquest and administration. We want to put some light on the great historical monuments built during the Chola dynasty. See if you have already visited these wonderful places. The Cholas were great artists and it was during their reign that some of the most exceptional temples were built in the Southern part of India along with the invention of exquisite bronze icons. Tamil Nadu saw a great development in its art and architecture with the magnificent temples built by the Chola rulers, now known as “Great Living Chola Temples”. The temples were built in the 11th and 12th century – Brihadeswara Temple in Thanjavur, Brihadeswara Temple in Gangaikondacholisvaram and the Airavatesvara Temple in Darasuram. The temples were built in Dravidian architectural style. Most Chola temples had intricate wall carvings. A garbhagriha was made as an abode for the deity. Small carved images of Hindu Gods and Goddesses were used inside the temple. The main deity of all the three living temples is Lord Shiva. The trend of dwaarpals (guardian figures) that was introduced by the Pallavas continued to be one of the salient features of Chola temples. Vimanas were another significant part of the temples as they were assumed massive by the Cholas. Statues of the ruling King was installed inside the temple. The Cholas built great temples while their long rule for over four centuries. However the list of temples built by the Cholas is quite long, only three are still surviving in the Tamil Nadu state of South India. Read on to know everything about the three great living Chola temples. The Brihadeswara Temple in Tanjavur still counts as the great achievement of the Chola rulers in the field of architecture. Earlier inscribed as the name Dakshina Meru, the temple was built by Rajaraja I who ruled from 985 CE to 1012 CE in the Chola dynasty. The construction was begun during 1003-1004 CE and it took around 6 regal years to get it completed by 1009-1010 CE. The main temple is surrounded by massive prakara and small shrines of the ashatadikpalas. There is also a main entrance having gopura, called Rajarajantiruvasal. The vimana is almost 60m high from the ground and this elevation is marked with Adhisthan and upapitha having bold mouldings. The ground tier of the temple, prastara is separated in two levels carrying Shiva images. Over this advances the 13 talas surmounted by Shikhara (octagonal in shape). You will also find a circumambulatory path around the main sanctum sheltering a large Shiva linga. The walls of the magnificent temple are adorned with impeccable and fine mural paintings. The second bhumi encompassing the garbhagriha has carvings of 81 out of the 108 karanas posing in Bharatanatya style. As you explore the massive temple, you will see a shrine dedicated to Amman dating back to the 13th century. How to Reach: Book cheap flights to Chennai and board a train from Chennai to Thanjavur. If you are planning to visit the place during pleasant weather, better book last minute flights right away! We would suggest you to visit Brihadeswara temple in Gangaikondacholisvaram, if you have explored the one in Thanjavur as this is considered as the feminine counterpart of the temple in Thanjavur. The Brihadeswara temple in Gangaikondacholisvaram is located in the District of Perambalur in Tamil Nadu. Built by the Chola emperor Rajendra I, the temple has extensive sculptures and carving on over the walls. There is an auspicious Saurapitha, called Solar altar and a lotus altar housing eight deities. How to Reach: Book cheap flights to Chennai and board a train from Chennai to Thanjavur. Another great living temple built in Thanjavur by Rajaraja I is the Airavateswara temple. Built in the 12th Century, this temple is smaller as compared to the other two Brihadeshwara temples in Thanjavur and Gangaikondacholisvaram. The temple is declared World Heritage Site by UNESCO along with the other two great living temples by the Cholas. There is a sanctum but no circumambulatory path around it and has axial mandapas. The front mandapa known as Rajagambhiran Tirumandapam in the inscriptions, is conceptualized same as a chariot making it an exceptional piece of art. It has exclusively ornate pillars. All the elevations in the temple are characterized with sculptures boasting the unique architecture of the Chola period. Many of the temple sculptures are classics of the Chola art till date. How to Reach: Book cheap flights to Chennai and board a train from Chennai to Thanjavur. In case you have booked business class flights for that important conference in Chennai, take a day or two extra in hand to visit the great living Chola temples in Thanjavur.